This large metal vase was one of my August Finds at a garage sale. After washing the vase, I painted it with two coats of Chalked Light Tint Base Paint, mixed in Chiffon Cream. You could also spray the vase with Zinsser Bulls Eye Clear Shellac Spray prior to painting to prevent rust or bleed through. 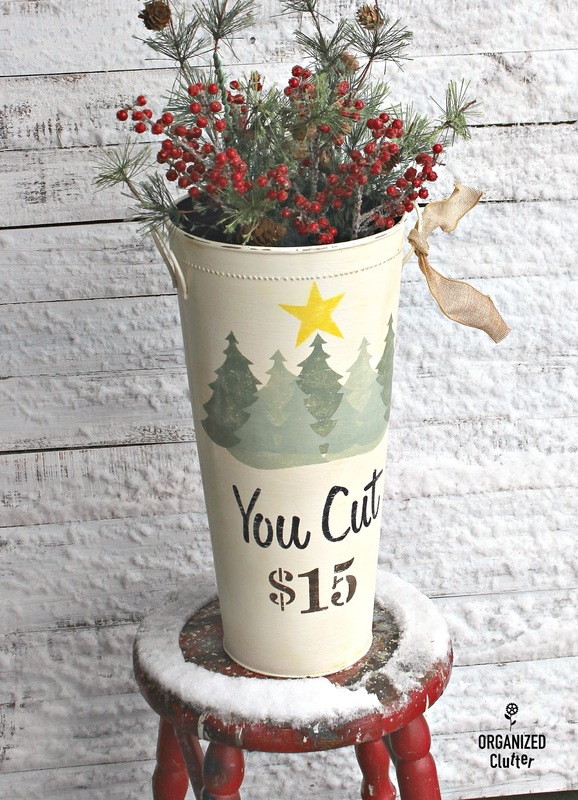 You could also use a Chalked Spray Paint. Here I am taping the tree stencil from *Old Sign Stencils You Cut Tree Farm collection. I used Waverly Moss Mineral Paint for the tree stencil from Walmart. I have the stencil taped down with blue painters tape but you will need to hold it down tight when stenciling on curves. I added two more trees by flipping the stencil over and inverting the stencil. Then I stenciled "You Cut" with Ceramcoat Acrylic Paint in Black . I then added two more trees in the forefront with the tree stencil using Waverly Mineral Paint in Celery. 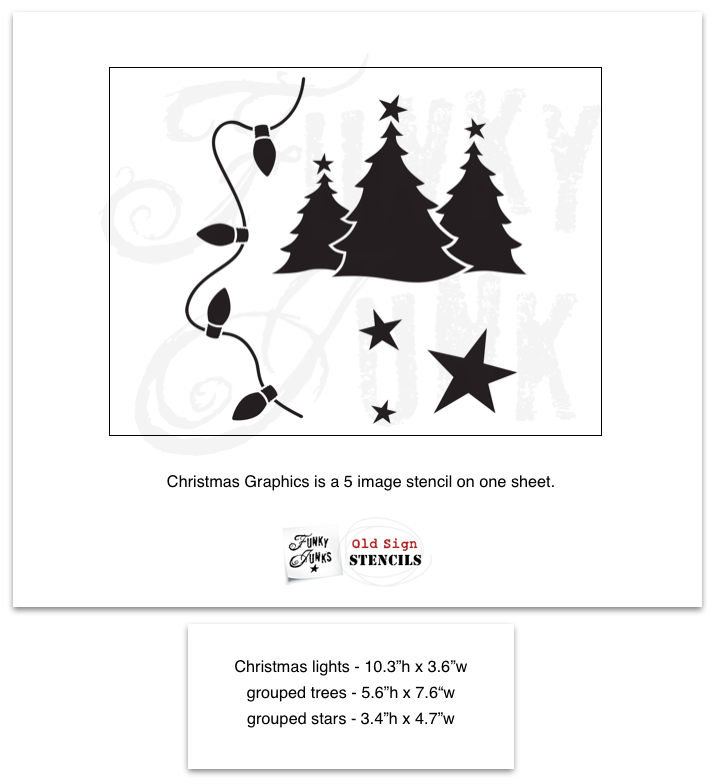 The star I added was from the Old Sign Stencils Christmas Graphics stencil. I used Ceramcoat Acrylic Paint in Opaque Yellow for the star. I sealed the vase with Varathane Crystal Clear Water-Based Polyurethane Satin Finish . This is the bleed through or rust that sometimes happens with light colored chalk paint or Fusion Mineral Paint too. I don't want this look with furniture, but for a rustic metal vase, I don't mind. It looks like rust or antiquing. You can use a couple coats of the shellac to prevent this, or I sometimes use a coat of a black flat enamel or satin as a base coat before my chalk paint. This works as well. NO staging necessary here in northern Minnesota! We have snow today. 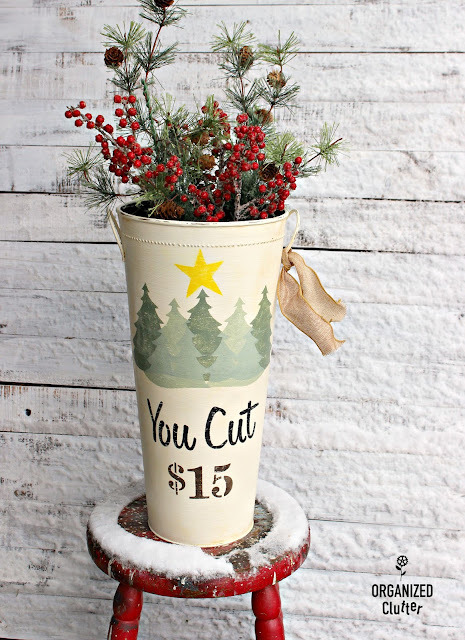 I ended up added the $15 with a number stencil from Darice. 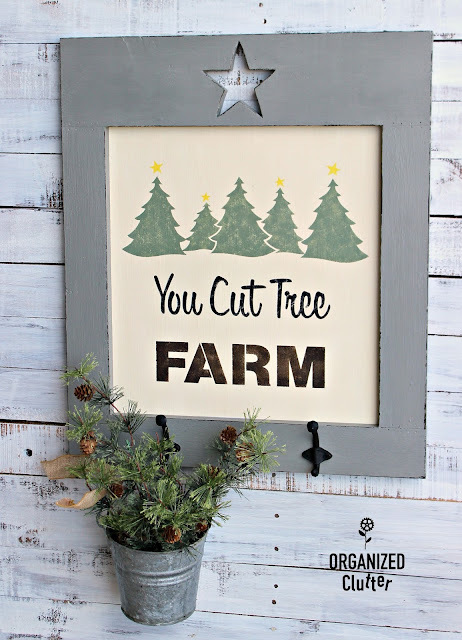 I also used the You Cut Tree farm stencil on a recent sign project. Farmhouse style added to a plain shelf. The vintage safety grater became a pumpkin. 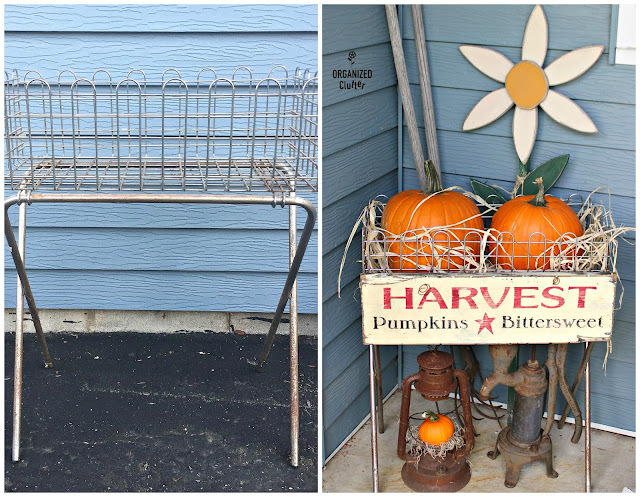 The wire basket on legs is now holding pumpkins on my fall covered patio. 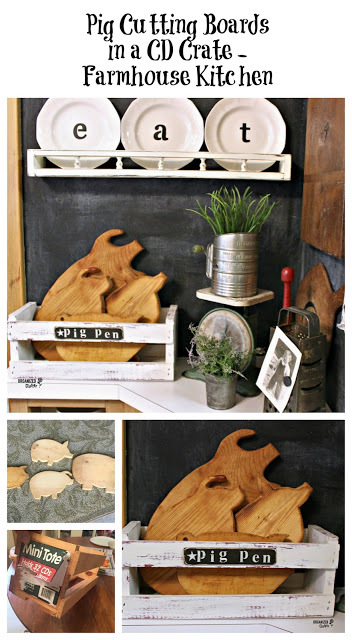 The pig cutting boards were darkened up to look old and corralled in a pen. An old desk tray gets a makeover with paint and stencils. Garage sale framed prints were painted and stenciled as signs. A garage sale stool went from blah to fun! Turned out super cute. Love the bleed though.